Carbon-lean production process: the carbon footprint of wood-based products is relatively low compared to alternatives such as plastic and metal products. This is because the production stages (timber harvesting and hauling, wood processing and treating) generate relatively little carbon, provided the wood is used locally and treated with eco-friendly products. Plastic and metal goods require a high energy input for the extraction and processing of raw materials. 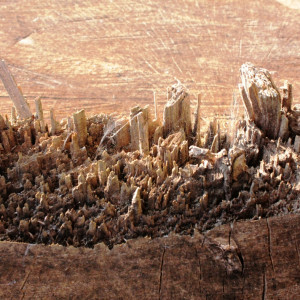 Carbon sequestration: the carbon dioxide absorbed from the atmosphere during tree growth, and converted in wood, can be locked up for decades by being made into furniture or incorporated into a building. Clean: the manufacture of local and sustainable wood products doesn’t generate toxic by-products or unusable wastes. It doesn’t require mining or drilling and their associated large-scale environmental damage. Beneficial to woodlands: research by the Forestry Commission amongst others indicates that much of the UK’s woodland is under-managed or not managed at all. Contrary to popular belief, such woodlands are often less valuable in terms of tree health and overall biodiversity. The use of wood goods provides an economic incentive to manage existing woodlands and create new ones, improving habitats and biodiversity, reducing soil erosion, reducing flood risk, etc. Renewable: Unlike mineral and fossil-derived materials, which are extracted from finite reserves, trees can be grown and harvested locally on an indefinite basis. This is only true if timber is sourced from sustainable forestry operations or from treework arisings, as opposed to deforestation. Local economy: a thriving wood-based market stimulates the local economy with jobs as diverse as woodland management, haulage, treework, crafts and retail. It also supports the rural economy and small-scale local businesses. Aesthetics and durability: wood products are often beautiful and possess unique tactile properties, and can be used for several generations. Forestry residues and arboricultural arisings not used for energy or some other application will usually rot, releasing green house gases. Some figures suggest that over 68% of this material is simply going to waste in the UK. The TreeStation’s unique sourcing strategy converts these arisings into useful products, with an additional positive impact on climate change, and unique items made of unusual species. NB- we are critically aware that wood-based products are not always sustainable or beneficial (e.g. destruction of tropical and temperate rainforest across the world). However, wood products don’t have to be associated with these devastating practices. We feel clear that the TreeStation’s activities are not destructive; in fact, our intention is that the project plays a positive role in creating a greener future. We are happy to engage in constructive discussion with anyone unsure about the genuine sustainability/ethics of our project. (^) Woodfuel Resource Study quoted by Woodsure website.